Cots & Space Savers. Height adjustable. The right to cancel is a no fault cancellation. If the goods are faulty then the standard statutory rights apply. Easy to clean play and feeding tray. Double Pushchair & Tandem. Adult supervision required. Colour: Blue Check. Car Seats & Boosters 9mth to 12yrs. Car Seats 9mths to 4yrs. £10 PER BOX. £16.00 (£6 per extra box). Back Carrier/Baby Carrier/Accessories. Nursery Room Sets. Northern Ireland - BT. AB30-31, AB33-38, AB41-45, AB51-56, AB63, DD8-10, FK8, FK17-21, IM1-9, IM99, IV1-28, IV30-32, IV36, IV40-56, IV63, KA27-28, KW1-3, KW5-14, PH10-11, PH13-14, PH19-26, PH30-44, PH49-50, TD15. 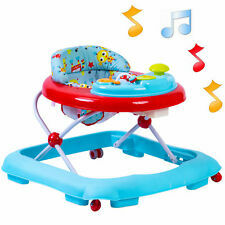 The Red Kite Baby Go Round Jive is bright and colourful walker that is suitable from 6 months. The Jive includes an electronic activity tray that has been designed to engage and entertain little ones. 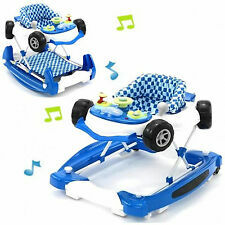 Blue/White Baby Walker Activity Musical Toy Push Along Ride. Easy folding, folds flat. 360 Degree Rotating plastic wheels. Detachable Music Panel. 2 Spinning Face Jokers. Material: ABS Plastic. 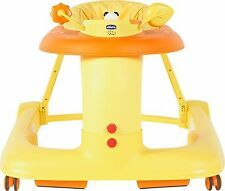 The fun-filled activity panel can also be removed from the walker for extra sit-down play. With lots of exciting activities, cheerful music, and friendly phrases, little ones will be introduced to numbers, shapes, animals, and colours. Easy folding, folds flat. 360 Degree Rotating plastic wheels. Detachable Music Panel. 2 Spinning Face Jokers. Suitable for 6/7 months upwards. Lightweight & easy to move around. Detachable and Washable Seat. Little Bambino. We do this as we need to take the defective item back to our supplier so that we get a credit note. 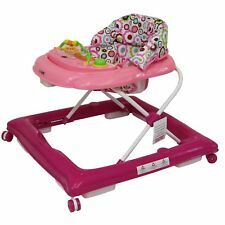 This Baby Walker doubles as an activity center that will stimulate baby's imagination and coordination. 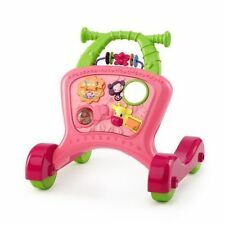 VTech Baby First Steps Baby Walker (8061763). Condition is Very good used condition. Lots of entertainment for the child as they learn to walk. From pet and smoke free home. Good used condition from a smoke and pet free home. Height adjustable. Easy folds flat for storage or travel. Hardly used so good condition with original box. The seat is freshly washed so nice condition. Thanks for looking. Collection from Ls7. ISafe 2 in 1 Walk & Rock And Entertainer is the perfect aid to assist your child/toddler with learning the skills of walking. 2017 iSafe OPTIMUM Stroller BOW Dots Design Stroller Travel Bag. 2017 iSafe OPTIMUM Stroller - BOW Dots Design The Best Stroller In The W.
Baby walker features Wipe clean or toss the seat cushion into the washing machine. Weight 5.26kg. Size H60.96, W86.36, D71.12cm. 2017 iSafe OPTIMUM Stroller - BOW Dots Design The Best Stroller In The W. 2017 iSafe OPTIMUM Stroller BOW Dots Design Parent Console. 2017 iSafe OPTIMUM Stroller BOW Dots Design Stroller Travel Bag. 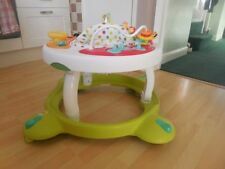 The baby go round jive is a bright and colourful walker that is suitable from 6 months. the jive includes an electronic activity tray that has been designed to engage and entertain little ones. the tray can also be removed to allow baby to play with their own toys if they wish, adding extra functionality to the walker. 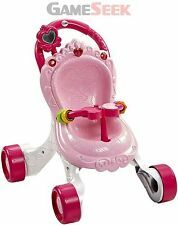 PINK BABY WALKER. 3 ADJUSTABLE HEIGHTS. BABY WALKER. BLUE WALKER. EASY FOLDING. LIGHT WEIGHT AND VERY EASY TO MOVE AROUND. TOY TRAY REQUIRES 2 AAA BATTERIES NOT INCLUDED. Really good condition. Comes from a smoke & pet free home. This item is for collection only. 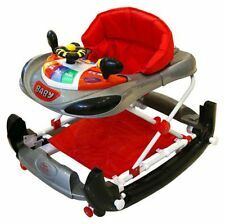 Baby Walker Rocker. Condition is Used. Only used a few times. Car Seats & Boosters 9mth to 12yrs. Car Seats 9mths to 4yrs. £10 PER BOX. £16.00 (£6 per extra box). Back Carrier/Baby Carrier/Accessories. HS1-9, KW15, PA20-49, PA62-78, PA80, ZE1-3. Nursery Room Sets. 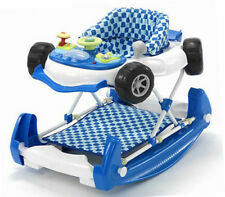 Baby walker Racing car Bought in Feb and used for 6 weeks max. In full working order. Bought for £60 From a pet and smoke free home. 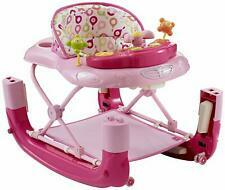 My Child Walk-n-rock 2 in 1 Baby Walker Neutral 6 Months Multi Height Adjust. Sparsely used. In good condition. Collection in person only. Little Bambino. It has great interactive features including detachable activity panels. This will have your child occupied for hours. We do this as we need to take the defective item back to our supplier so that we get a credit note. EASY BABY WALKER. Help baby with walking skills. Keep your baby safely by your side. Baby balances more naturally with hand free. Save parents from constant bending and back pain. Fun for kids and parents.